Crystal Dunn scored for the Courage in their draw against the visiting Utah Royals FC. The North Carolina Courage and Utah Royals FC tied 2-2 on a sunny day in Cary, North Carolina at Sahlen’s Stadium at WakeMed Soccer Park in front of 3,958 fans. Utah Royals FC snapped the No. 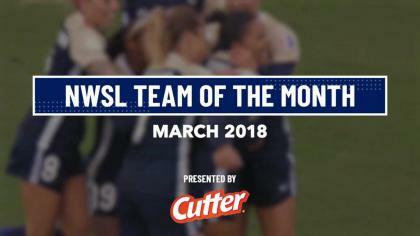 1 Courage’s winning streak and earned a big point on the road after falling in their season opener in Week 3 to the Chicago Red Stars 1-0 on Saturday, April 14. The Courage earned three points just three days ago, after a 1-0 victory over Seattle Reign FC in a Wednesday night meeting. The Courage entered Saturday’s Game of the Week with their eyes on a perfect 5-0-0 start to the season. Splitting points at home with Utah Royals FC put the Courage at 4-0-1 in league play and Utah Royals FC improve to 0-1-3. Utah Royals FC are still in search of their first win in club history. The Courage got on the scoreboard early thanks to a Merritt Mathias strike in just the sixth minute of play. “Oh my goodness” was heard throughout the stadium after Mathias’ blast put her team up 1-0. 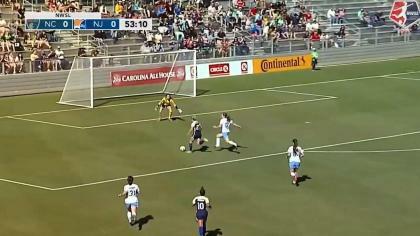 The North Carolina defender struck the ball after an Abby Dahlkemper corner kick was poorly cleared by Utah midfielder Desiree Scott. Mathias struck it one time from far out and it shot it past Utah Royals FC goalkeeper Abby Smith into the upper-90. Mathias’ strike set the tone for the first half. The Courage controlled the tempo of the first 45 minutes earning a 53.5% possession to Utah’s 46.5%. The Courage also dominated in shots with six to the Utah’s one. The Courage rode out the 1-0 lead throughout the first half with forward Jess McDonald seeing a chance to extend her team’s lead by two in the 23rd minute. Crystal Dunn who entered Saturday’s game as second in the league in chances created with 11, served McDonald a driven ball on a platter. McDonald was able to get her head on it, however she was unable to direct it properly and saw it hit off of her head wide. The chances continued to come for the hosting side with the Courage earning six corners by the 26th minute mark. Dahlkemper and defender Jalene Hinkle alternated on taking corner kicks– Dahlkemper’s service was more out-swinging and Hinkle’s looked far post. Utah Royals FC were able to keep the crashing Courage offense off the board for the rest of the first half despite being pressured the entire half defensively. The second half took a different tone, as Utah Royals FC equalized in the 52nd minute of play off forward Katie Stengel’s header goal. Dahlkemper and Rowland seemed to have miscommunicated on a play that where Dahlkemper attempted to clear a long ball with a header, however Rowland was way off her line also looking like she was trying to collect it. This is when Stengel turned on her jets and followed the play through eventually knocking one home for her side. Before this game, Utah Royals FC had not scored a goal in 267 minutes of play. Finally, Stengel broke that streak and buried one for the big equalizer, also her first of the season. The Courage had only conceded two goals up until Stengel’s goal and found themselves trailing for the first time all year after Utah Royals FC forward Brittany Ratcliffe rocketed one in from outside the box in the 66th minute. The Courage suffered another mishap in the back which eventually led to Ratcliffe’s goal. Defender Abby Erceg played the ball back to Rowland for the clearance, however Rowland’s clearance went right to the foot of Ratcliffe outside of the box. Ratcliffe collected the ball, took a few touches, then struck it from the right side into the near high corner for the 2-1 lead. At this point of the match Utah Royals FC were on pace for their first win of 2018, while the Courage were scraping to get out of their first loss of the year. The Courage made a sub in the 66th minute which sent Kristen Hamilton out and midfielder Samanatha Mewis in. Mewis made her 2018 debut in Wednesday’s match after missing the first three games of the season with a right knee injury. Utah Royals FC also made big substitutions as well. In the 69th minute Amy Rodriguez and Elise Thorsnes entered the game. Rodriguez made her 2018 NWSL debut in Utah Royals FC’s home opener in Week 3. In the 74th minute Rodriguez looked like she would extend her team’s lead by two, but Rowland was able to collect it and keep the game within one. The Courage would not go down without a fight, and in pure Courage fashion in the 80th minute they put the pressure on. Midfielder Denise O’Sullivan, who earned possession 12 times on the day for her team, played a driven through ball over Utah’s backline. Dunn and Lynn Wiliams were both crashing the net and goalkeeper Smith ran out of her box to get a foot on it and clear. Smith, in an attempt to kick it away missed it and the ball deflected off of her into the stride of Dunn. Dunn earned the equalizer for her team. Dunn now has two goals on the year and is tied with McDonald and Zerboni for most goals on the team. The game concluded with Utah Royals FC holding a slightly higher full-time possession percent at 51.2% to the Courage’s 48.8%. The Courage will return to action on Saturday, April 28 at Houston, and Utah Royals FC will seek their first win of the year when they welcome Portland Thorns FC to Rio Tinto on Saturday, April 28 for Week 5. Match ends, North Carolina Courage 2, Utah Royals 2. Second Half ends, North Carolina Courage 2, Utah Royals 2. Substitution, North Carolina Courage. Elizabeth Eddy replaces Denise O'Sullivan. Substitution, Utah Royals. Diana Matheson replaces Brittany Ratcliffe. Attempt missed. Abby Erceg (North Carolina Courage) right footed shot from the left side of the six yard box is close, but misses the top left corner. Assisted by Jaelene Hinkle with a cross following a set piece situation. Offside, Utah Royals. Rachel Corsie tries a through ball, but Amy Rodriguez is caught offside. Goal! North Carolina Courage 2, Utah Royals 2. Crystal Dunn (North Carolina Courage) left footed shot from outside the box to the bottom left corner. Attempt saved. Amy Rodriguez (Utah Royals) left footed shot from outside the box is saved in the centre of the goal. Assisted by Katie Stengel. Substitution, Utah Royals. Amy Rodriguez replaces Lo'eau LaBonta. Substitution, Utah Royals. Elise Thorsnes replaces Kelley O'Hara. Hand ball by Brittany Ratcliffe (Utah Royals). Goal! North Carolina Courage 1, Utah Royals 2. Brittany Ratcliffe (Utah Royals) right footed shot from outside the box to the top right corner. Offside, North Carolina Courage. Jaelene Hinkle tries a through ball, but Darian Jenkins is caught offside. Attempt saved. Kristen Hamilton (North Carolina Courage) right footed shot from the centre of the box is saved in the top centre of the goal. Assisted by Jaelene Hinkle with a cross. Corner, North Carolina Courage. Conceded by Gunnhildur Yrsa Jonsdottir. Goal! North Carolina Courage 1, Utah Royals 1. Katie Stengel (Utah Royals) header from the left side of the six yard box to the top left corner. Attempt saved. Jessica McDonald (North Carolina Courage) right footed shot from the centre of the box is saved in the centre of the goal. Assisted by Lynn Williams. Offside, North Carolina Courage. Katelyn Rowland tries a through ball, but Lynn Williams is caught offside. Offside, Utah Royals. Katie Bowen tries a through ball, but Brittany Ratcliffe is caught offside. Hand ball by Jessica McDonald (North Carolina Courage). Attempt saved. Crystal Dunn (North Carolina Courage) left footed shot from outside the box is saved in the bottom left corner. Assisted by McCall Zerboni. Second Half begins North Carolina Courage 1, Utah Royals 0. First Half ends, North Carolina Courage 1, Utah Royals 0. Attempt missed. Lynn Williams (North Carolina Courage) right footed shot from outside the box is too high. Assisted by Kristen Hamilton. Attempt saved. Kelley O'Hara (Utah Royals) right footed shot from outside the box is saved in the top left corner. Brittany Ratcliffe (Utah Royals) is shown the yellow card for a bad foul. Attempt missed. Jessica McDonald (North Carolina Courage) header from the centre of the box is too high. Assisted by Jaelene Hinkle with a cross following a corner. Attempt missed. McCall Zerboni (North Carolina Courage) header from very close range is too high. Assisted by Abby Dahlkemper with a cross following a corner. Attempt missed. Jessica McDonald (North Carolina Courage) header from the centre of the box misses to the right. Assisted by Crystal Dunn with a cross. Goal! North Carolina Courage 1, Utah Royals 0. Merritt Mathias (North Carolina Courage) right footed shot from outside the box to the top right corner following a corner.